The bar is pretty high after the first round of evaluations. There are a few areas that I have found most OmniFocus competitors fail hard and a few that make OmniFocus look like a LeapFrog application. This is an odd omission. No system I have found has an option to indicate a sequential or unordered list of tasks for a project. Worse, some systems have almost no option for setting the order of tasks. Who are these people that do buckshot project management? This is a real stumbling block. I like to dump things into my inbox for processing later. Sometimes it's just the name of a project. Sometimes I think it's a task and it ends up being a project. If I can't change my mind without completely recreating the entry, you're wasting my time. Wouldn't it be great if you could set a project to a particular context and then all tasks inherited that context? Yes, yes it would be. It's just a convenience, but a logical one. I want windows into my tasks and projects. I don't want to do a search every time I open the application. Of course, if the system doesn't support tags, contexts or locations, there's very little to filter. If a system does have all of those things and no saved searches or filters, then I have to wonder why those things even exist. Sometimes projects are in the someday bucket. I don't want to see them every single flipping day. It's common that I will plan a project (either partially or completely) and circumstances will change. A stake holder will postpone it or the budget gets kicked down the road to another fiscal year. I've already put in the thought and effort to structure the project, why make me waste all of that work? Yes, projects and tasks often have a due date. But you know what they always have? A start date! Very few systems I've looked at have anything like a start date. Some have "tomorrow" or "next week" flags but that kind of planning is for people that fail a lot. Each service name header links out to the website for the service. Free for 500 items. $50 per year for unlimited lists, Dropbox backup and some other features. iOS apps are free. Free 2 week trial. $100 per year for an account. Apps are free. The GetFlow web app, iOS and Mac application are all top notch. They are well designed and functional. GetFlow focuses on team activities and provides a complete audit trail for changes made by any member. Members can add rich comments that include files and images. It's a great collaboration environment. While it probably works well for some people I really don't need team management. The interface is nice but the lack of start dates and good view filters hurt the GetFlow system. The GetFlow web app is particularly good. Free for a basic account. $25/yr for a pro account. The pro account is required for the mobile apps and Outlook plugin. Remember The Milk got me started with task management many years ago. It works great for a simple life. When my life got more complicated, RTM began to feel like a bunch of hacks strung together. I like the RTM custom syntax and they may have pioneered the concept of quick entry. There's a lot to like about RTM for a basic task management solution but it really doesn't work for me. Wunderlist demos nicely in videos and screenshots. In reality only the Web app worked for me. 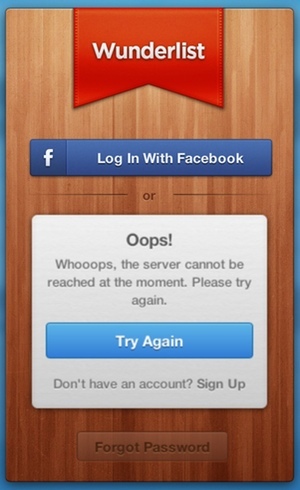 While the experience on the web is very nice, the problems on iOS were numerous for me. The website is very pretty. It feels like a real application. There are desktop notifications when used through a browser like Chrome. Tasks can be reordered through drag and drop and pop-overs feel seamless. The design of the web application is impeccable but there were many gaps in the features for my use cases. The lack of start dates and sequential or independent tasks made it hard to plan complex projects. Projects are called lists and a list can have a sub-list of tasks. That resembles nested projects and is a nice option but very shallow. There's no good way to hide tasks that are not yet actionable. I really wanted to like Wunderlist but constant issues with connecting on iOS killed the experience. I consistently had problems on both iPhone and iPad. I gave up after only a couple days so to be fair I spent the least amount of time testing Wunderlist. $20 per year for a pro account. All apps are free for the pro account. 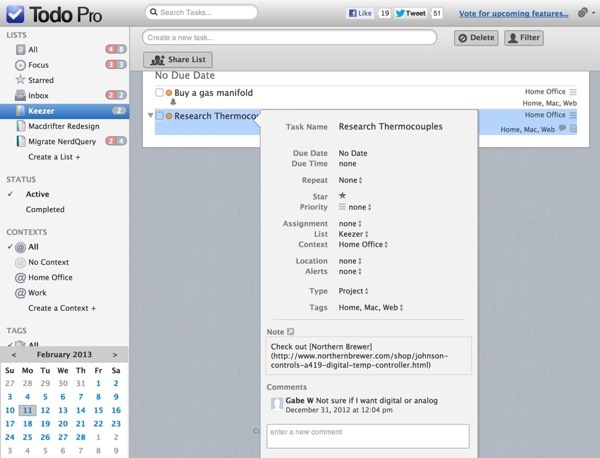 Todo Pro started life as an iPad that leveraged the familiar feel of a day planner. Well, at least it was familiar in the early 90's. The cartoon three-ring binder and phony pages make the iPad app distracting and very ugly. The iPhone uses a standard table view for data and fits the device much better. The web app is the nicest of all the experiences in my opinion. The feature set of Todo Pro is nearly complete, except for the lack of start dates. The real problem I have with the system is the confusing options for creating tasks on the iPad. Tasks can be of several types, including a list. So a task becomes a task of tasks. It's not a project or even a sub-project, it's a task of tasks. This confusing option is omitted from the web app. The web app, while attractive, is less functional than some of the best in this category. There is drag and drop support for adding tags and contexts but no hot key triggering. The pricing model for Todo Pro seems like it is in the process of transitioning from paid apps and free syncing to free apps and paid syncing. The web app is only available with the Pro account while the paid apps can sync through Dropbox and Todoodledo. The Pro service actually adds a lot of functionality for the price. 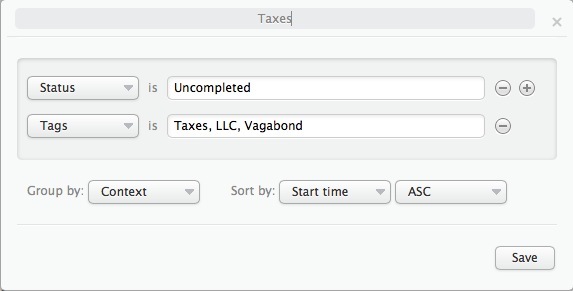 The real prized features of OmniFocus can be had in a Todo Pro account for a fraction of the price. Things like Siri support for entering tasks and creating tasks by email are available in the Pro version. There are no hierarchical projects deeper than 2 levels and there are no folders to group projects. There are no start dates for tasks or projects. There are no perspectives or saved views. There is a free limited account that lacks file upload, collaboration and subtasks. There's also an intermediate $15 per year account that lacks file upload. The Pro Plus account is $30 per year and adds 10GB of file upload storage. Toodledo is overlay complex and can be difficult to navigate. The web app is particularly challenging. The simple function of creating a new project is somewhat bewildering. But it provides a great API for third party developers which can make it a good syncing backend. Toodledo is one of the very few systems that include start dates for tasks. There's a lot to like about the Toodledo task options. I'm sure I could get comfortable with the web app after some more time with it. Like OmniFocus, it can be intimidating for a new user. Unfortunately, Toodledo is ugly. I don't just mean that it has a bad color palette. It's aesthetically offensive and completely unintuitive. I just couldn't bring myself to use it on a regular basis. It's real shame too since Toodledo has so many of the core task management features I require. So, after washing my eyes a bit, I moved on over to another system. This is really a project management hub. It's focused on building software and has some really nice features if that's what you're looking for. It all deliverable, defect and feature driven. Even simple tasks are complex. Clocking It is pretty interesting for it's intended use, but not great for individual task management. Moving on. Free for individuals. $20/mo for teams. Producteev is not a GTD system. It's a team manager's system. A manager creates workspaces and then invites contributors to it. I just found it too limiting to be useful. This was a short assessment. Doit.im is not just a dumb web interface. It's the most attractive of the bunch and adds a good deal of convenience. There are also fully realized notifications sprinkled throughout. The tags in Doit allowed me to create pseudo nested projects. A nice feature of the web application is that each project shows a list of all tags contained within it. Click a tag filter and only tasks with those tags are displayed. ⌘ clicking tags allows for multiple tag selection. 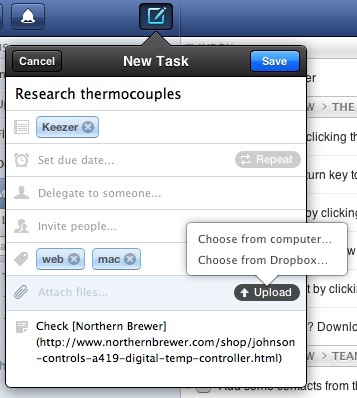 This was a nice way to quickly see related tasks as might be the case with a nested project. Doit's best feature is still in it's early days: Saved filters. Doit provides an advanced search builder that is used to build up complex search terms. Any advanced search can be saved as a sidebar filter that also shows up in the iOS apps. I felt like I was in a dream state when I found this feature. Why is that not a common task app feature? Unfortunately, the filter combinations are "and" booleans only. There is no concept of exclusion or optional query features. Doit also recently introduced a rudimentary review system. It's nothing like the OmniFocus for iPad review system but better than nothing. I have two big complaints about Doit. once a project is set to inactive, I could not access the tasks in it. 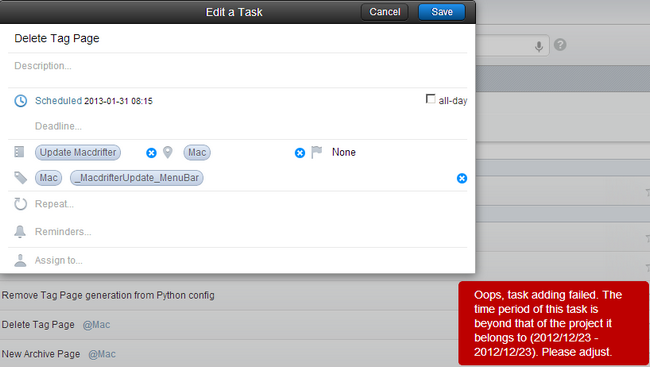 I can add additional tasks but I must activate the project to see and edit tasks. Secondly, and probably more importantly, there is no option to manually reorder tasks. 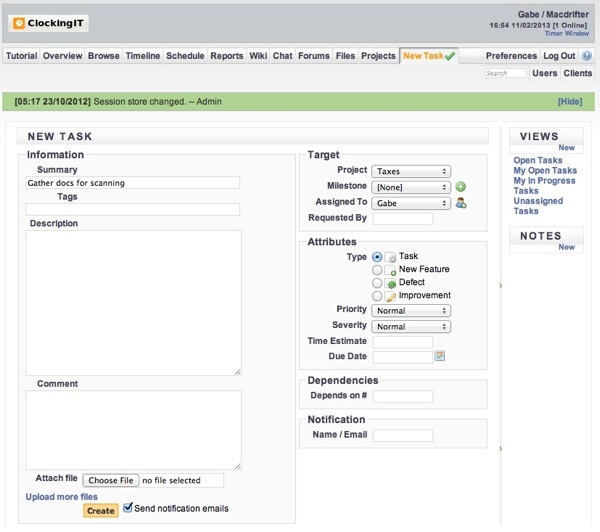 Tasks can be prioritized with flags but no drag and drop reordering. That's a big problem. Asana's biggest hole is the lack of sophisticated search and sort. While there is simple tag sorting there's nothing to provide detailed control like OmniFocus perspectives. Asana is a team organization tool and it shows. I like some of the features but not enough to replace OmniFocus. Subtasks are an interesting trick. A single task can have a sub-list of tasks but I would rather have more complete project hierarchy. The Asana web app has a lot of features for a non-native application. For example, there are multi-select and edit for tasks, as well as keyboard shortcuts and drag and drop task reordering. File attachment is also very easy with a clever option to link with Dropbox to attach files already stored on the file syncing service. 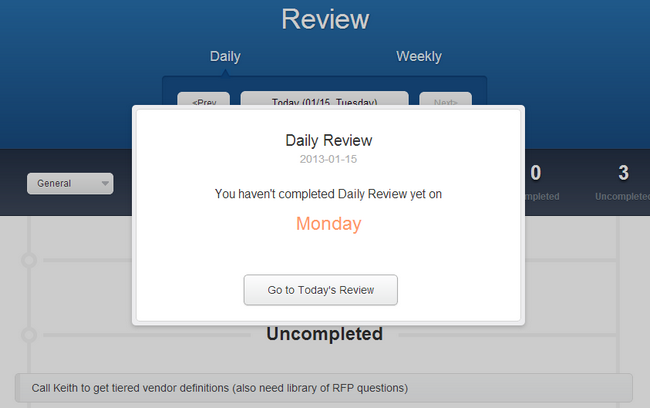 Asana misses the mark by not providing start dates for tasks or a review mode. Overall, Asana is very nice. It's not the best out there, but I think it would work for a "normal" person and would be particularly great for a small team working on a small project. I didn't just review these systems. I lived in most of them.2 This review took several months to complete. I've used OmniFocus for almost 6 years continuously with only a few indiscretions.3 I could afford a little time away to see what else is out there. I covered Nirvana in my previous post and I liked it enough to keep working with it. I've accepted some of the trade-offs now and think that it most closely resembles my ideal toolkit if I left OmniFocus. Doit.im has some really novel and great features. It still feels incomplete without manual task ordering. For a straight up task and simple project management system, either Nirvana or Doit.im would be a great option. They both have a terrific web interface and solid iOS apps. But for me, OmniFocus is still the best solution for right now. I manage many large projects that span several years with dozens of people. I mix work tasks with home tasks. I plan incessantly and care about dependencies and sequences. These are the things that I care about and many of these things are what OmniFocus does better. Overall, OmniFocus still comes out on top, but just barely. After seeing how multiple contexts and smart filters can be done well, I'm more convinced than ever that it's a missing piece of the puzzle for OmniFocus. While I don't see assignments or reference material as particularly strong selling points for a new system, I do see the value in using them sparingly. I've also learned a lot about how I work. I paid close attention to my motivations throughout this process. I ruled out some things that I thought I wanted and reaffirmed a couple too. That's for another day. Now I have a bunch of apps to delete off of my devices.